Stenciled, photo silk-screened, commercially available cotton fabrics. Machine pieced, hand appliquéd; hand quilted. Robin Schwalb comments: "New York is an impossible, noisy, invigorating, endlessly varied and fascinating city, with one of the most beautiful skylines in the world, but to work and commute and live here is often a far less grand experience. 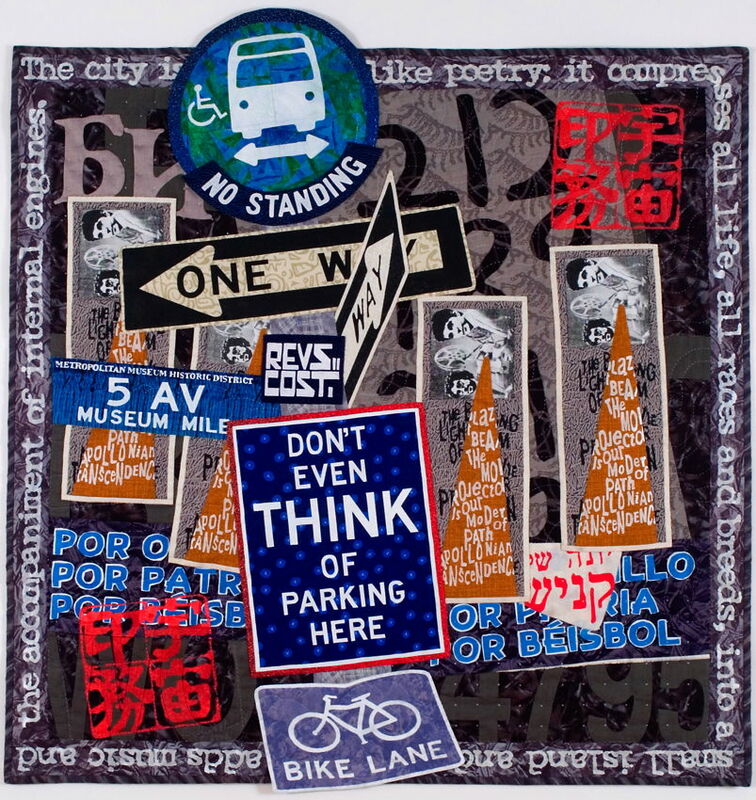 'Don't Even THINK of Parking Here,' an old parking sign from the days of Mayor Koch, is as pure an expression of New York, with all of its frustrations and attitude and arrogance and wit, as one could possibly want. This quilt combines the official, rule-laden side of the polis—and the anarchic presence of graffiti artists. The heart ('for pride, for country, for baseball' in Spanish) and the stomach ("Yonah Schimmel's Knishes," in Yiddish) are referenced, as well as the life of the mind (in quotes from E. B. White's classic essay, 'Here is New York' and from Camille Paglia's 'Sexual Personae: Art and Decadence from Nefertiti to Emily Dickinson'). There are bits and pieces of my own history, in the form of old phone numbers, and the small portraits of my husband and myself as movie projectionists, as well as a shout out to the Metropolitan Museum of Art, where I've been employed for nearly thirty-two years." This quilt was originally amde for the Manhattan Quilters Guild exhibition "MetroTextural."